Elijah's father died when he was very young so Elijah went to the care of his uncle, Micheal Tetteh. At the time Micheal could not support him and as a result went to live with his grandmother along with Micheal's other child Barbarah. Micheal knew about Patrick and his foundation as he had already brought his other three children there; Christiana, Rachael and David. Once the grandmother got to old and poor to support Elijah and Barbarah he brought them to th orphanage. This totals five of his children at the orphanage. Patrick made an arrangement with Micheal that he must find a job within a year to support his children. As of March 2013, the year had passed and Micheal remains unemployed. Micheal does not come to the orphanage often as he is embarrassed and ashamed that he cannot provide for his five children. Fortunately, Elijah is very settled and extremely happy at the orphanage now and his best friends Gideon, Justice and Abednego all live here. 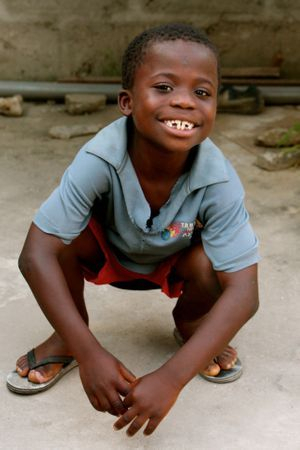 He loves playing football and is always keen to work and helps as much as he can with any chores. His favourite colour is red and when he grows up he wants to be a doctor.